In February of 2013, after years of study and conversation with the community, the Park Board of Commissioners approved a contract for a newly designed facility to replace the Knoch Park Central Maintenance Facility. 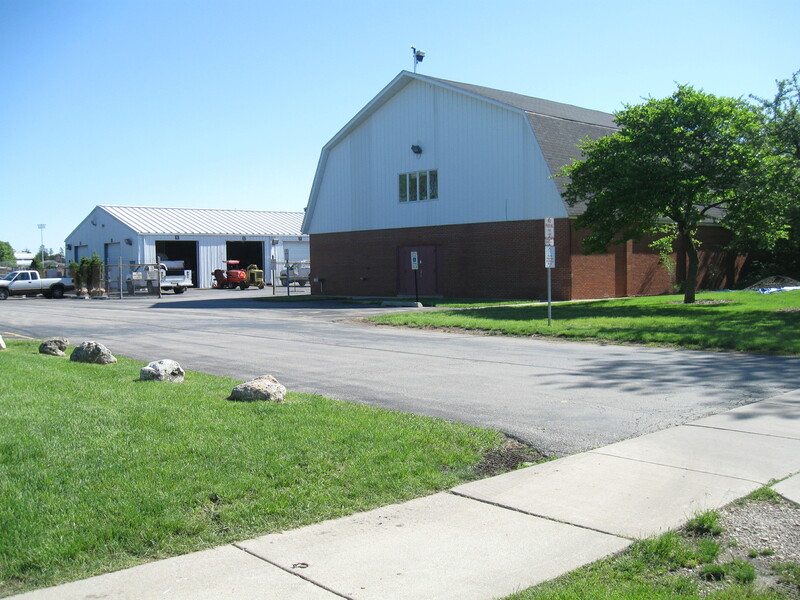 Demolition of the existing Barn (built in 1965) and Maintenance Shed (built in the late 1970’s) and construction of a new replacement Central Maintenance Facility at Knoch Park was the original recommendation of the 2009 Facility Study and 2010 Review Team Assessment. 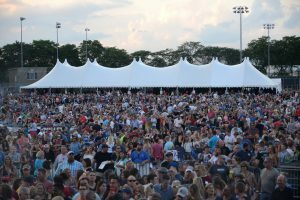 Lamp was tasked with the demolition and new construction after the Naperville Rib Fest 2016, scheduled to be operational in June 2017, in time for summer operations, programs, and community events including Ribfest. 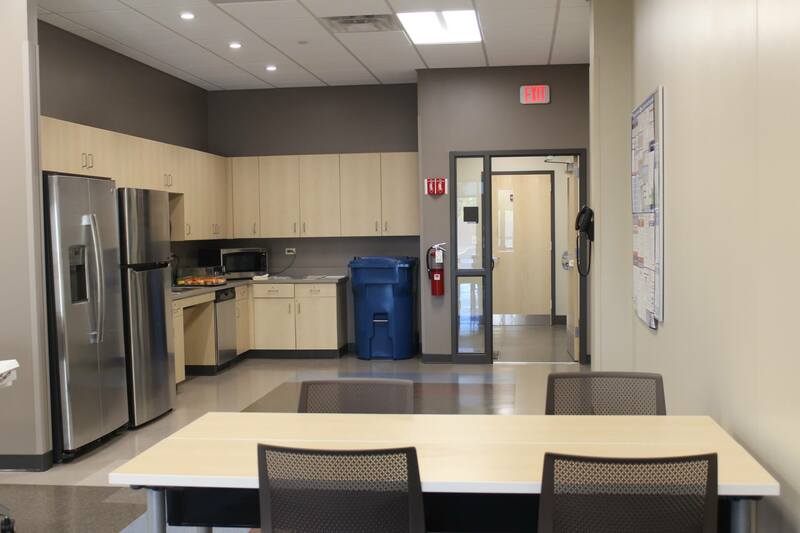 Administration areas: a large meeting room, full kitchen, and locker room areas for the staff. 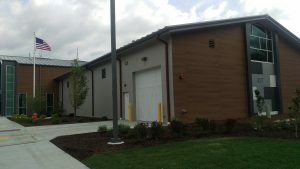 Parks Police Department: spaces include separate gear storage lockers, evidence holding lockers, and a small secured armory room for their firearms. 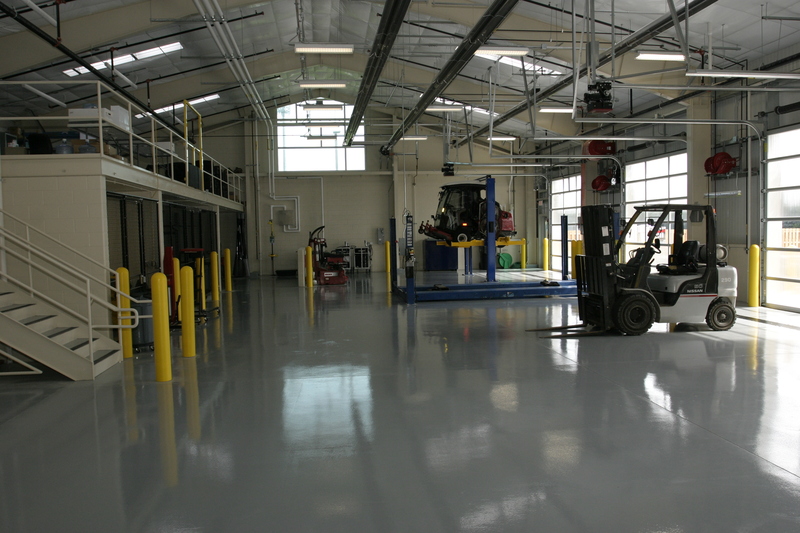 Parks Garage storage: all different types of tools and equipment used throughout the seasons and a chemical rinse bay with secured storage for the chemicals. 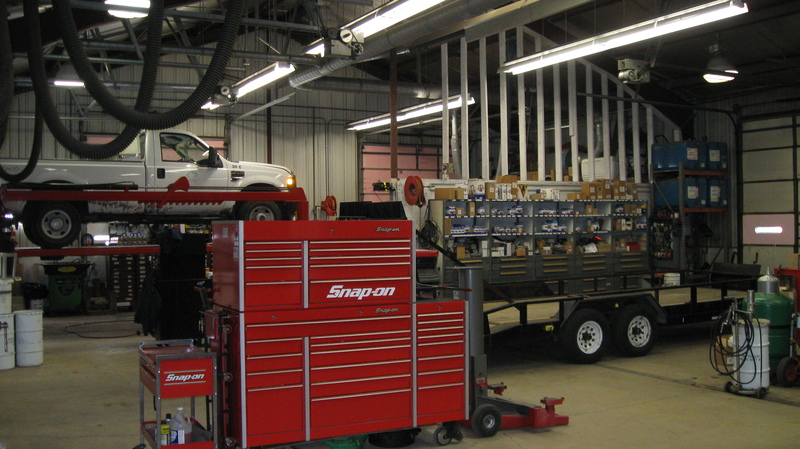 Trades Garage: carpentry workshop with all the tools and equipment needed for projects and individual storage rooms for tools, hardware, lumber and a paint booth equipped with all the necessary safety requirements. 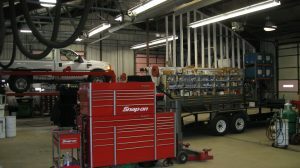 Fleet Garage: complete vehicle service garage that includes lifts for trucks and mowing equipment, and a welding shop including storage areas. Project was completed just in time for Ribfest! Notice is hereby given that Huntley Park District, McHenry County, IL will receive sealed bids from interested trade contractors for 03A-2 Building Concrete, 04A-2 Masonry, 06A-2 General Trades, 09F-2 Flooring, 09G-2 Painting, 21A-2 Fire Protection System, 22A-2 Plumbing, 23A-2 HVAC, 26A-2 Electrical, 31A-2 Excavation, and 33A-2 Site Utilities, for the Maintenance Facility and REC Center Renovations project. Sealed bids will be received at the Huntley Park District REC Center, 12015 Mill Street, Huntley, IL 60142, Attn: Mr. Thom Palmer, Executive Director, until 1:00 pm, Thursday, October 13, 2016. Bids proposals will be publicly opened and read immediately following. Bids must be submitted in duplicate in a sealed envelope, and labeled “Maintenance Facility and REC Renovations”, the date and time of the bid opening, the Contractor’s name and address, and the Trade Package that is being bid on. A bid day label will be supplied in the project manual. The proposed project consists of a 12,000 square foot Maintenance Facility with associated site work and REC Renovations. 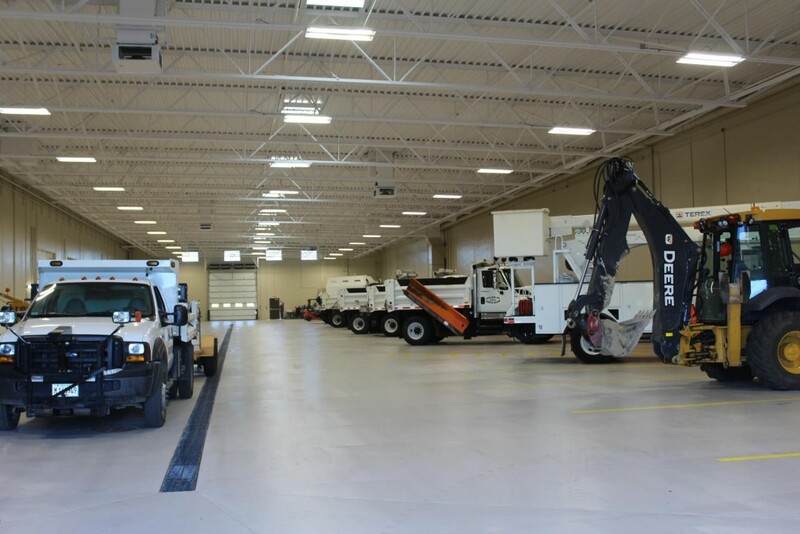 South Elgin Public Works facility completed on time and under budget! South Elgin Public Works now has a new public works facility that offers space to house city plows, a salt dome, a training room, a water testing lab for the water department, garages, repair space for parks maintenance vehicles, and more. 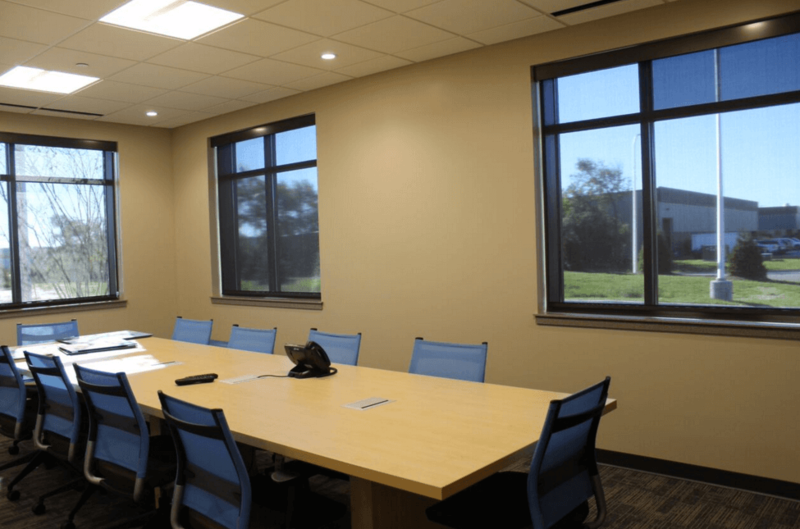 Lamp Incorporated was the Construction Manager on this $7.2 million project, which includes 44,000 square foot garage with 6,000 square feet of administrative office and other-use space. 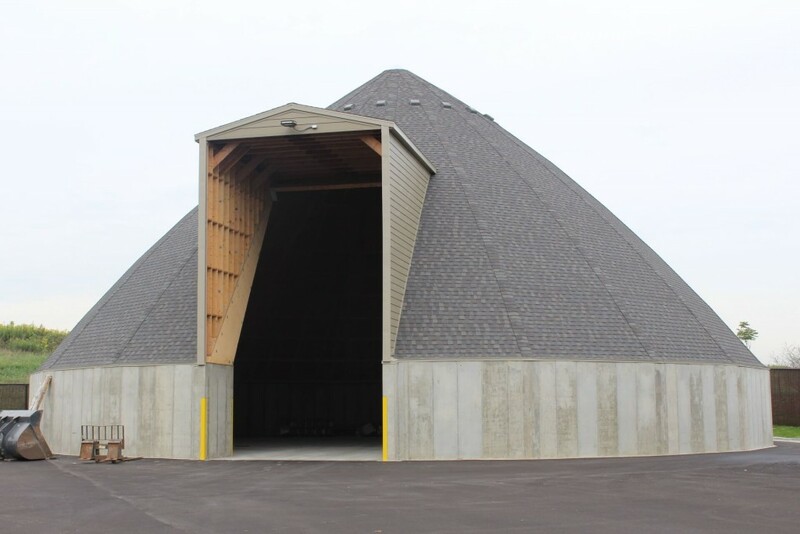 The facility greatly improves snow plow operations for the village, as the previous space required snow plow blades to be removed before storage. 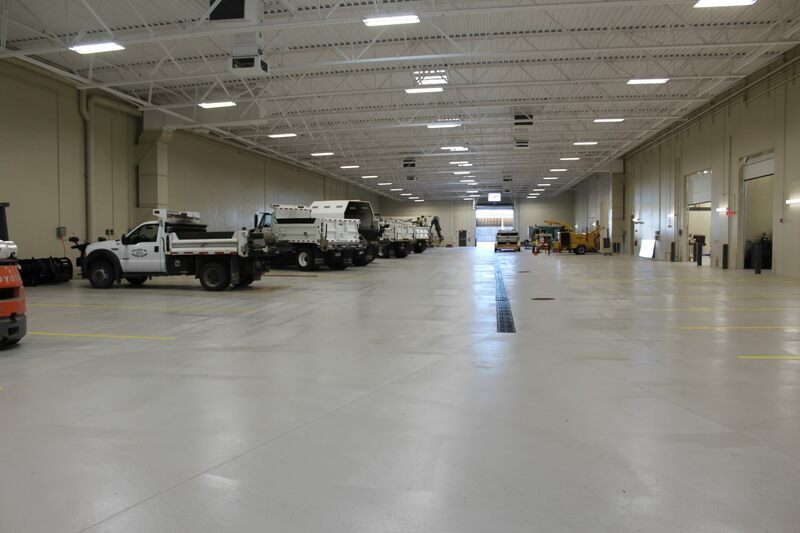 With the new space, each vehicle has the space needed to enter and leave with blades attached, saving time and cost. 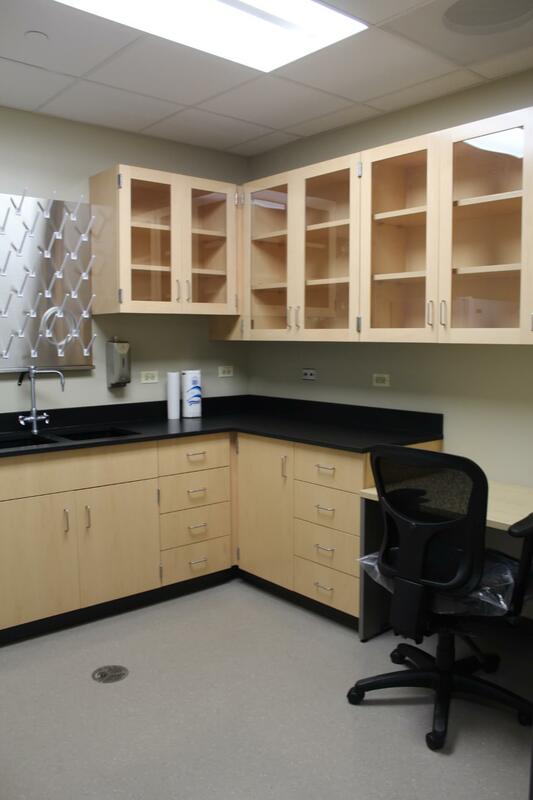 The new space is designed to accommodate 25 percent population growth in South Elgin. Read more about the new facility in the Chicago Tribune. https://lampinc.net/wp-content/uploads/2016/09/LampSEVW-1.png 476 854 sg-lamp https://lampinc.net/wp-content/uploads/2019/01/Lamp_Logo_Color_B-copy-300x132.png sg-lamp2016-09-15 16:30:592018-01-18 20:10:44South Elgin Public Works facility completed on time and under budget! 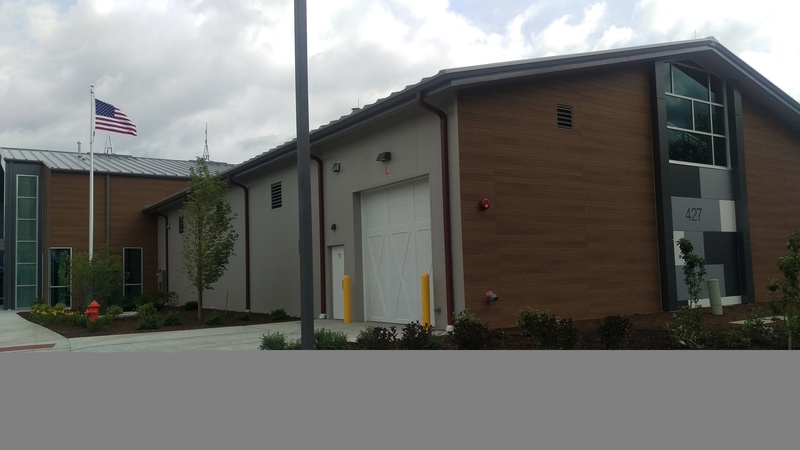 We are excited to be working as Construction Manager on the Naperville Park District Knoch Park Central Maintenance Facility. 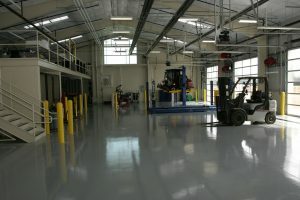 The facility is located at 427 Martin Avenue in Naperville, Illinois. 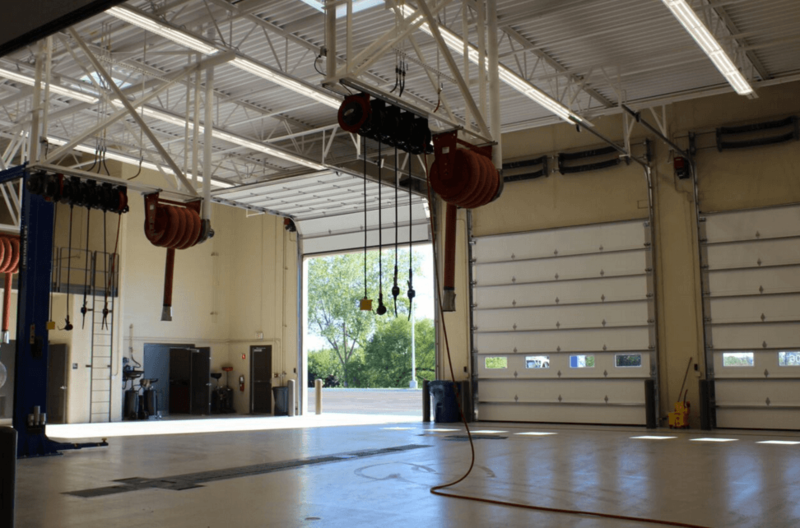 For this project, we will be managing the construction of a new 25,000 square foot central maintenance facility, including the public works garage and shop areas, and administrative office areas. Various site improvements are also associated within this project scope. The bid process is complete. Construction will begin this summer, after Rib Fest and the project is scheduled to be completed by May 2017. Renderings of the new building are shown below. Current buildings will be demolished to make way for the stylish new building, which will address issues of ADA accessibility and work-life safety. 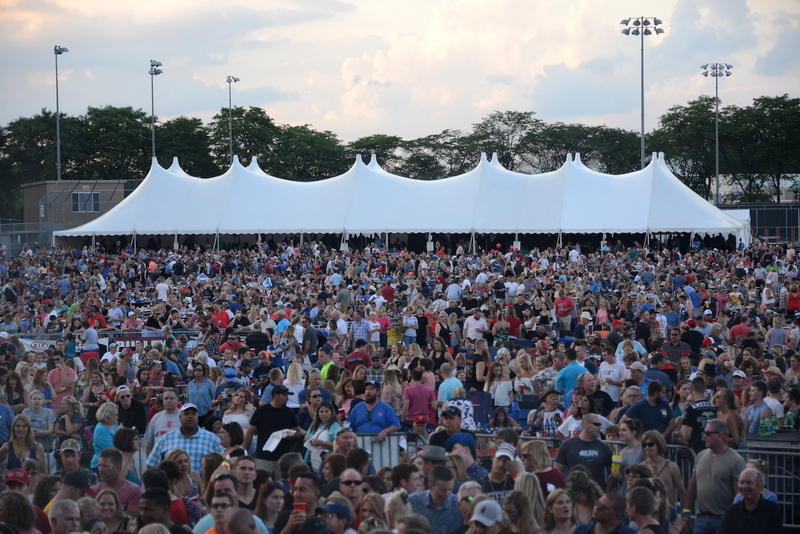 Read more about the project background and plan from the Naperville Park District. Interested in more updates on Lamp projects? Join our eList below. 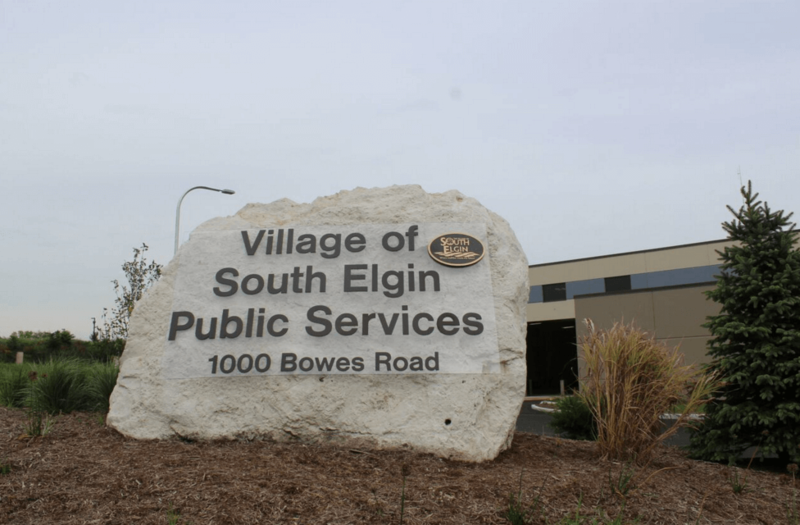 The city of Elgin will host a dedication ceremony at 11:30 a.m. Wednesday at Kiwanis Park (formally Observatory Park), at National and Villa streets. The ceremony will recognize the Kiwanis Club of Elgin and its partners who teamed up to construct a gazebo in the park. Other organizations that assisted with the project were Lamp Inc., the Housing Authority of Elgin, Kane County Health Department and the Elgin Golden K Club. The total cost for the project was about $62,000. For more details, call 847-931-6127. Advocate Sherman Hospital, in partnership with the city of Elgin, will host the 27th Annual Halloween Family Fun Fair from 10 a.m. to 2 p.m. Saturday at The Centre of Elgin, 100 Symphony Way. With an emphasis on health and well-being, this free event will feature a variety of fun and educational activities. A costume contest will take place from 11 a.m. to 1 p.m. for children ages 12 and younger. Prizes will be awarded for best character look-alike, most creative and best makeup. In addition to games, children will get a glimpse inside an ambulance, police car and fire engine during one of the tours. The fair also will feature pediatric developmental screenings, Kidcare Photo IDs, a safe-toys booth, and various health and safety information booths. The fair will include a car seat safety check by Advocate Sherman Hospital and Kane County Safe Kids. Certified child passenger safety technicians will inspect child safety seats and provide instruction. This event is free to the community, and no registration is required. For more information, call 1.800.3ADVOCATE or visit www.AdvocateHealth.com/events. Advocate Sherman Hospital will celebrate National Food Day on Thursday, a nationwide movement for healthy, affordable and sustainable food. The lake level and café of the hospital will transform into a farmer’s market open to the public from 11 a.m. to 2 p.m. Vendors from the Downtown Elgin Harvest Market will be on site with local produce, meat, baked goods and other locally grown and produced items. Attendees can learn how to incorporate fresh foods into their diet and how to start a garden, with advice from Sherman Community Gardeners and the University of Illinois Master Gardeners. Sherman dietitians will share tips on how to shop for fresh foods and prepare nutritious meals. Other vendors at the event include the new member-owner grocery Shared Harvest Co-Op, and Food for Greater Elgin. Sherman’s café chefs will prepare items from the official Food Day cookbook and share the recipes. Attendees can collect recipe cards at each Food Day station for a chance to win a $50 gift certificate to Sherman’s Tree House Gift Shop. For more information, call Advocate Sherman Public Affairs & Marketing at 224-783-8700. Community United Methodist Church in South Elgin will host its annual “Trunk-or-Treat” community event from 2 to 4 p.m. Sunday. Refreshments will be served, and children can “Trunk-or-Treat” for candy, play various games, and participate in other exciting activities. This free event is open to all. The church is at 400 W. Spring St. More information is at 847-931-0563 or cumcsouthelgin@sbcglobal.net. Church In The Word will host its fifth-annual “Trunk or Treat” community event from 2 to 4 p.m. Saturday. A group of cars decorated and stuffed with candy will line up in the parking lot at 430 Airport Road for an afternoon of free food, games, costumes and candy. Families and local businesses team up to provide this free, fall event. Children can “trick-or-treat” from one car to the next, playing games and collecting candy. There will be warm beverages and snacks, and giant inflatables for the kids to bounce around in. The Redefined Student Ministry will host a “students only” lounge for middle school and high school students. For more information, visit www.ChurchInTheWord.com or call 224-585-9673. Artist Jean Muntz will demonstrate how to arrange dried native grasses, leaves, berries, seed pods, branches and flowers into works of art at the Northern Kane County Wild Ones meeting at 7 p.m. Thursday at Christ the Lord Lutheran Church, 12N462 Tina Trail, Elgin. Attendees are asked to bring their own vase or other container, pruners or scissors, and any dried material they would like to use or share. A limited amount will be provided. No background in floral arranging is necessary. The Kane County Sheriff’s Office and the Drug Enforcement Administration (DEA) will offer the public its seventh opportunity in three years to prevent pill abuse and theft by ridding their homes of potentially dangerous expired, unused and unwanted prescription drugs. People can bring medications for disposal from 10 a.m. to 2 p.m. Saturday at the sheriff’s office, at 37W755 Route 38, St. Charles. The service is free and anonymous. The sheriff’s office is one of several sites in the county that will participate in this initiative. If residents are not able to come to the sheriff’s office, they are encouraged to find additional sites in the community. A list of sites can be found at the DEA’s Office of Diversion Control website at www.deadiversion.usdoj.gov. Also, the sheriff’s office does accept any unused or unwanted prescription medicines during normal office hours. People can come to the front desk at the sheriff’s office and turn these medicines in. According to the DEA website last April, Americans turned in 371 tons (more than 742,000 pounds) of prescription drugs at more than 5,800 sites operated by the DEA and its thousands of state and local law enforcement partners. In its six previous Take Back events, DEA and its partners took in more than 2.8 million pounds — more than 1,400 tons — of pills. A Heart for Animals has a fundraising goal of $3,000 at its Howl-o-ween Bash and Fundraiser on Saturday to pay for medical care for animals in foster care. The event is open to adults, and children must be 11 years-old and older. No pets will be admitted. The winner of the best costume award will win a $200 cash prize. The event includes buffet dinner, DJ, silent auction, raffles, 50/50 raffle, one drink ticket and cash bar for $30. Raffle prizes include Chicago Blackhawks tickets and other items. All proceeds go directly to benefit the rescue animals. The Howl-o-ween Bash and Fundraiser will be held from 7 to 11 p.m. at Old Towne Hall, 54 Brink St., Crystal Lake. To purchase tickets or make a donation, call 847-868-2432 or visit www.aheartforanimals.org for details. Donations are tax-deductible. WEST DUNDEE — Grand opening celebrations will be held Saturday for the $12.4 million Dundee Township Park District Randall Oaks Recreation Center and the Fox River Valley Public Library District’s branch Library inside the center. A ribbon cutting ceremony for the facilities will take place at 10 a.m. at the center, 500 N. Randall Road. Visitors can tour the new facility and participate in free health and wellness screenings, group exercise class demonstrations and children’s activities. Library staff will be on hand to give tours, issue library cards, and answer questions at the branch from 10 a.m. to 2 p.m. The 53,000-square-foot recreation center was funded by existing park district tax resources and Build America Bonds, which will provide a 35 percent interest rebate to the district. The center includes a 5,500-square-foot, state-of-the-art fitness center; double gymnasium with two full-size basketball courts; elevated three-lane track; group exercise studio; KidZone (child watch room); preschool; and multipurpose room. Center hours will be 5 a.m. to 10 p.m. Monday through Friday and 7 a.m. to 5 p.m. weekends. More information is available by calling the center at 847-836-4260. The 5,000-square-foot branch library, located on the lower level of the center, will feature a variety of materials with the latest titles, older popular books and select audiovisuals. Patrons will find satellite-sized areas including adult fiction and non-fiction, teens, children, audiovisual, adult and game computers, and study tables. Check-out stations, automated return equipment and an outdoor drive-up book return have been installed to make visits efficient and allow more time to browse around and make selections. Hours for the new branch location will be 10 a.m. to 6 p.m. Monday and Wednesday, noon to 8 p.m. Tuesday and Thursday, and 9 a.m. to 5 p.m. Saturday. It will be closed on Fridays and Sundays. “As the branch hours were mapped out, all of our different patrons and their library needs were considered,” said library Director Roxane Bennett. Patrons who already have an item on hold and would like to pick it up at the Randall Oaks Branch instead of the Dundee Library can call the Dundee Library at 847-428-3661, ext. 5876; or email dundeeref@dundeelibrary.info (include library card number or have it handy) beginning Monday. More information is available by calling the library or visiting the website at www.frvpld.info. WEST DUNDEE – Workers touched up paint, employees unpacked boxes, and a handful of people tried out the new exercise equipment at Randall Oaks Recreation Center. The center opened this week – a so-called soft opening before a grand opening celebration Aug. 25. 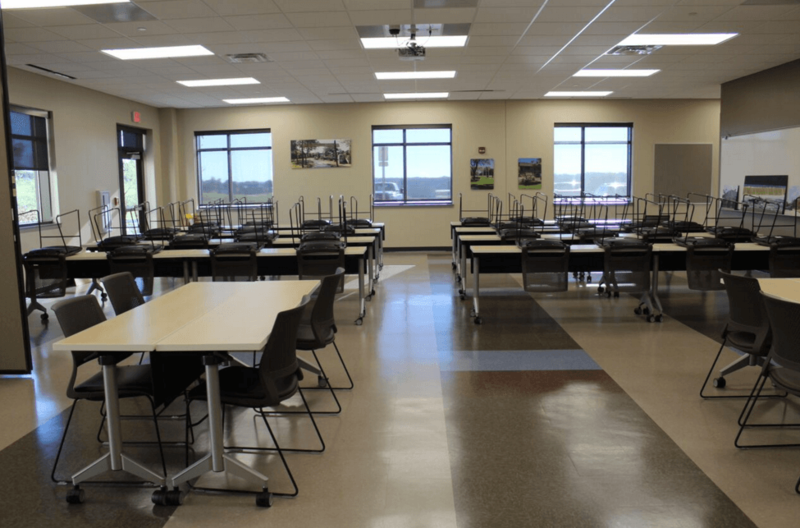 “To train the staff, it made sense to actually have it open so we could do some live training,” said Jim Miller, deputy director of the Dundee Township Park District. Inside the center is a preschool room, a baby-sitting room, a fitness center, basketball courts and a library. The project was budgeted at $12.4 million. It is expected to come in about $250,000 under budget, Miller said. Money for the center came from Build America Bonds, money made available through the federal economic stimulus act. Property taxes will not increase because of the new facility, Miller said. The facility also includes a west side branch of the Fox River Valley Public Library District. The library is leasing recreation center space for at least five years and could be there for as long as 10 years, Miller said. The recreation center library branch is 5,000 square feet. Users will be able to sign up for a library card at the branch and check out or renew materials, Branch Manager Nancy Kendzior said. Besides new and popular materials, the branch will focus on health and fitness materials, she said. Elsewhere in the center, The Kidzone is play area with computers, toys and a Ninetendo Wii gaming system. Parents will be able to drop off children ages 6 weeks to 11 years while they go workout. There is a preschool room for 3- to 5-year-olds, with toys and small chairs and tables, among other things. The group exercise studio has a maple floor designed to absorb the impact of moving up and down. Spin, Pilates classes and other classes will be there. The basketball courts have six baskets. The floor is rubber to take the wear and tear from competitions and different programs. In the park district, the Fox River sometimes serves as a barrier because only two bridges cross it. “A lot of the growth has been on the west side,” said Helen Shumate, director of marketing and communications for the district. Miller said a facility on the west side was something residents wanted. Twenty years ago, officials within the Dundee Township Park District started talking about building a new recreation center. And evidence of those talks has finally come to fruition. The 53,000-square-foot Randall Oaks Recreation Center will open its doors to the public on Monday, a full month ahead of schedule, said Jim Miller, deputy director of the Dundee Township Park District. 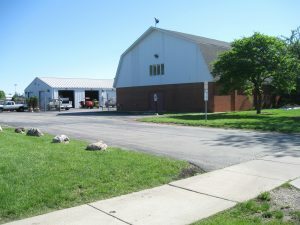 The building, at 500 N. Randall Road in West Dundee, was expected to cost $12.43 million, but came in $250,000 under budget, which means extra money for the district’s capital projects budget. The new rec center offers a double gymnasium, a fitness center with 80 machines, an elevated track, a tuition-based preschool, a group exercise studio, a multipurpose room and a baby-sitting room. Other perks include locker rooms, a machine that refills water bottles and comfortable bleachers. Moreover, the Fox River Valley Public Library is leasing space within the building for its new west side branch. You can start checking out books during the branch’s grand opening from 10 a.m. to 2 p.m. Aug. 25, library director Roxane Bennett said. Besides books of all types, there will be public computers, DVDs and Blu-ray discs. Miller bills the new recreation center as a complement to its Rakow Center in Carpentersville. The fitness center at Randall Oaks is 5,500 square feet, three times larger than the one at the Rakow Center. But unlike the Rakow Center, Randall Oaks does not offer a swimming pool, racquetball courts or a day care center. “We’re trying not to compete against ourselves,” Miller said. Staff members — including 50 new employees hired to work at the center — and construction workers were putting the finishing touches on the building and unpacking boxes of various equipment. The district paid for the building with its reserves and Build America Bonds. There were no tax rate increases or referendums involved in the construction of the building, Miller said. A special grand opening is scheduled 10 a.m. to 2 p.m. Aug. 25 and will include free health and wellness screenings. Annual fitness memberships cost $396 for township residents and $480 for others. The township includes the Dundees, Sleepy Hollow, Carpentersville and parts of Elgin, Gilberts and Barrington Hills.